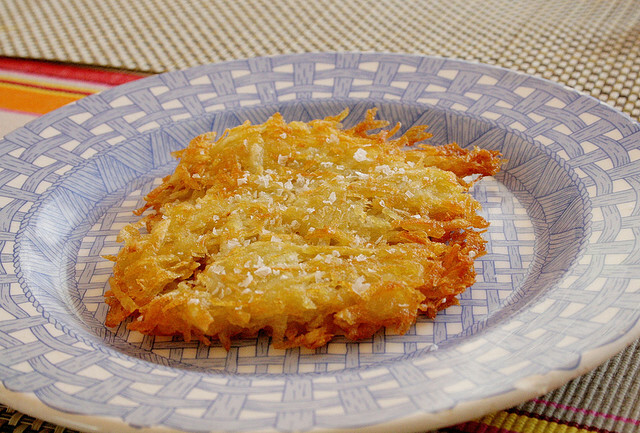 The trick to hash brown potatoes is the same as for french fries. The potatoes must be dry when they hit the pan, other side the surface starch absorbs the water, not sealing the surface, allowing the interior to absorb the grease. Dry the grated potatoes very well using a kitchen towel. Then, don't even try to move the potatoes until the bottom is well browned, to avoid sticking. Russet, or high starch, potatoes make the best hash browns. Peel potatoes and grate into a large bowl. Dry potatoes thoroughly by squeezing in a kitchen towel. You should have about 1-1/2 cups grated potatoes, loosely packed into measuring cups. Toss with garlic salt and pepper. Place half the butter and half the olive oil in a heavy large skillet and heat until sizzling. Add the onion and cook for a few seconds over high heat. When fragrant, add all of the potatoes and pack down with a spatula.